This page shows the latest Yellow Card news and features for those working in and with pharma, biotech and healthcare. month. 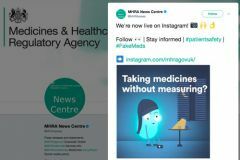 NICE has focused on AMR and diabetes to date, while the UK medicines regulator has so far been using Instgram to encourage the use of its Yellow Card scheme. Foy added: “You can help make medicines safer by reporting any suspected side effects easily and quickly through our Yellow Card Scheme online or via the mobile app.”. .
Yellow Card app allows potential side-effects tobe sent directly to the MHRA. ... Its formation prompted by the Thalidomide safety scandal, the Yellow Card Scheme was set up to monitor the safety of UK medicines and act as an early warning system.